Now, you’re ready to connect your iPhone to your computer and iTunes. You can set up a daily wireless sync, which is called iTunes Wi-Fi Sync, or you can physically connect your iPhone to your computer with the USB connector cable and run the iTunes Sync feature. However, even if you plan to use iTunes Wi-Fi Sync, you must connect your iPhone to your computer one time. The first time you connect your iPhone to your computer, iTunes opens and you can set up and perform your first automatic sync. This article will go through those initial operations and then explain manual syncing. It will also look at establishing the criteria for future syncing operations. These instructions are for iTunes 11.1 (126), which you can download for free from the Apple website. iTunes is available in both Mac and Windows versions. Click either the Get iTunes for Windows or Get iTunes for Macintosh link (although it’s highly unlikely you would have a Mac without iTunes) and then click Download Now. The download begins automatically. Follow the on-screen instructions to install iTunes on your computer. Connect your iPhone to your computer with the USB connector cable, using a port that is on your computer rather than one on the keyboard or hub (unless you have a powered hub). iTunes opens. If iTunes doesn’t open, open it manually. If this is the first time you connect an iPhone to iTunes, you probably want to choose Set Up As New iPhone. However, if you backup an iPod touch or iPad to iTunes, you can put that data on your iPhone. Click Get Started on the next screen. The iPhone Summary window appears. In subsequent connections, select your iPhone from the pop-up device menu at the top right of the window. If iTunes doesn’t recognize your iPhone, make sure the USB connector cable is firmly seated in both your iPhone and computer ports and that your iPhone is turned on. If iTunes still doesn’t see your iPhone, choose iTunes→Preferences on a Mac or Edit→Preferences in Windows. Click the Devices icon at the top of the window that opens. Deselect the box next to Prevent iPods, iPhones, and iPads from Syncing Automatically. Click OK to activate the new setting. iCloud: Select this choice to use iCloud as your backup destination. 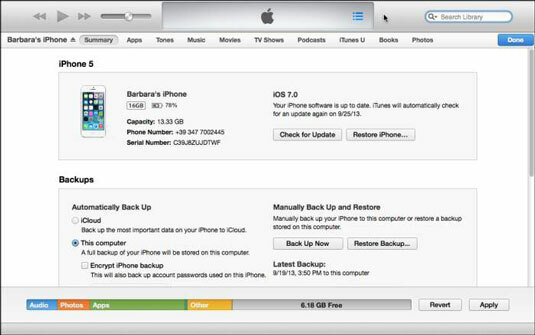 This Computer: Select this choice if you want to keep your iPhone backup on your computer. You have a subchoice of Encrypt iPhone Backup. Type a password in the dialog that appears. When you restore a backup to your iPhone, you’ll be asked to enter the password. Automatically sync when this iPhone is connected: Automatically launches iTunes and begins syncing when you connect your iPhone to your computer with the USB connector cable. When this box is not checked, you sync manually by clicking the Sync button in the bottom right corner. If the Prevent iPods, iPhones, and iPads from Syncing Automatically option in the Devices pane of iTunes Preferences (iTunes→Preferences on a Mac; Edit→Preferences on a PC) is checked, this option appears dimmed and unavailable. Sync with this iPhone over Wi-Fi: Your iPhone syncs with iTunes once a day when both your computer and iPhone are connected to the same Wi-Fi network, and iTunes is open on your computer. Apple recommends that your iPhone is connected to a power source. Although you can sync without power, it significantly drains the battery. Sync only checked songs and videos: Only songs and videos that you manually check are synced. If you sync a playlist that contains unchecked songs and sync the playlist, the unchecked songs are not included in the sync. This means going through your iTunes library and manually selecting or deselecting all the songs and videos you have stored on your computer. Prefer standard definition videos: Standard definition videos occupy less memory than high definition videos, so you may prefer to sync SD videos to your iPhone. Convert higher bit rate songs to 128/192/256 kbps: iTunes automatically creates smaller audio files so you can squeeze more music onto your iPhone. Manually manage music and videos: Select this if you want to click and drag music and videos from iTunes to your iPhone. If you want to limit the music or videos stored on your iPhone, this may be a good option to choose. Reset Warnings: Click this button if, in the past, you’ve asked iTunes to stop showing you purchase and download warnings but you would like to see those warnings again. The Configure Accessibility button: Click this button to turn on the various Universal Access functions, such as VoiceOver and Speak Auto-Text. You can override the automatic syncing on an as-needed basis by launching iTunes before you connect your iPhone to your computer. Press and hold Command+Option (Mac) or Shift+Ctrl (PC) and connect your iPhone. Hold the keys until your iPhone appears in right end of the navigation bar below the toolbar. Your iPhone won’t sync automatically, but the settings you previously established remain unchanged.